For the Noah Ashenhurst novel, see Comfort Food (novel). Comfort food is food that provides a nostalgic or sentimental value to someone, and may be characterized by its high caloric nature, high carbohydrate level, or simple preparation. The nostalgia may be specific to an individual, or it may apply to a specific culture. The term comfort food has been traced back at least to 1966, when the Palm Beach Post used it in a story: "Adults, when under severe emotional stress, turn to what could be called 'comfort food'—food associated with the security of childhood, like mother's poached egg or famous chicken soup." They are believed to be a great coping mechanism for rapidly soothing negative feelings. Consuming energy-dense, high calorie, high in fat or salt, or sweet food; such as ice cream, chocolate or french fries, could trigger the reward system in a human's brain, which give a distinctive pleasure or temporarily feeling better. Comfort foods may be consumed to reduce stress and feel better. Regarding the psychological aspects of food addiction that led to the unhealthy eating habits, people often use comfort food to treat themselves. Those with negative emotions tend to eat unhealthy food in an effort to experience the instant gratification which resulted in good feeling — although only short-lived. The identification of particular items as comfort food may be idiosyncratic, though patterns are detectable. In one study of American preferences, "males preferred warm, hearty, meal-related comfort foods (such as steak, casseroles, and soup) while females instead preferred comfort foods that were more snack related (such as chocolate and ice cream). In addition, younger people preferred more snack-related comfort foods compared to those over 55 years of age." The study also revealed strong connections between consumption of comfort foods and feelings of guilt. An article, "The Myth of Comfort Food" asserted that men tend to choose these types of savory comfort foods because they remind them of being "pampered" or spoiled, while women choose snack-related foods because they are associated with low amounts of work and less "cleanup." It also suggested that women are more likely to reach for unhealthier foods in times of stress due to more weight-conscious mindsets. A partial list by country of comfort foods around the world. A plate of classic poutine at a Montreal restaurant. 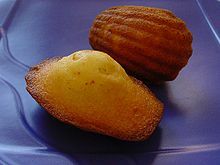 A madeleine. A madeleine de Proust is a French expression specifically referring to Marcel Proust's description of comfort food in In Search of Lost Time. Some popular Indonesian foods are considered to be comfort food, usually served hot or warm, and soupy or with a soft texture. Most of them are high in carbs or fat, such as fried rice, congee, and noodles which are high in carbs; while meatballs and grilled skewered meats contains fair amount of fat and salt. Comfort foods often are the kind of food that provides nostalgic sentiments, as they often called masakan rumahan (home cooking) or masakan ibu (mother's dishes). In Indonesia, the warm and soft texture of bubur ayam is believed to help people to recover during convalescence. Sayur sop or sup ayam is Indonesian chicken soup that often sought during flu. The warm soup contains chunk of chicken, bits of potato, carrot, and common green bean served in chicken stock. Chowders: Clam chowder, Shrimp chowder, Corn chowder, etc. ^ "Comfort Food." (definition). Merriam-webster.com. Accessed July 2011. ^ "Comfort food". WordNet 3.1. Retrieved 10 January 2016. ^ a b Romm, Cari (3 April 2015). "Why Comfort Food Comforts". The Atlantic. Retrieved 21 July 2015. ^ Heshmat, Shahram (28 Sep 2016). "5 Reasons Why We Crave Comfort Foods". Psychology Today. Retrieved 2018-09-05. ^ Wansink, Brian; Sangerman, Cynthia (July 2000). "Engineering comfort foods". American Demographics: 66–7. ^ "The Science behind Comfort Food - Desert Hope". Desert Hope. Retrieved 2018-09-06. ^ Locher, Julie L.; Yoels, William C.; Maurer, Donna; Van Ells, Jillian (2005). "Comfort Foods: An Exploratory Journey into the Social and Emotional Significance of Food". Food and Foodways. 13 (4): 273–97. doi:10.1080/07409710500334509. ^ Wansink, B; Cheney, M; Chan, N (2003). "Exploring comfort food preferences across age and gender". Physiology & Behavior. 79 (4–5): 739–47. doi:10.1016/S0031-9384(03)00203-8. PMID 12954417. ^ Dallman, Mary F.; Pecoraro, Norman; Akana, Susan F.; La Fleur, Susanne E.; Gomez, Francisca; Houshyar, Hani; Bell, M. E.; Bhatnagar, Seema; Laugero, Kevin D.; Manalo, Sotara (2003). "Chronic stress and obesity: A new view of 'comfort food'". Proceedings of the National Academy of Sciences. 100 (20): 11696–701. doi:10.1073/pnas.1934666100. JSTOR 3147854. PMC 208820. PMID 12975524. ^ Dallman, Mary F.; Pecoraro, Norman C.; La Fleur, Susanne E. (2005). "Chronic stress and comfort foods: Self-medication and abdominal obesity". Brain, Behavior, and Immunity. 19 (4): 275–80. doi:10.1016/j.bbi.2004.11.004. PMID 15944067. ^ Dube, L; Lebel, J; Lu, J (2005). "Affect asymmetry and comfort food consumption". Physiology & Behavior. 86 (4): 559–67. CiteSeerX 10.1.1.424.1134. doi:10.1016/j.physbeh.2005.08.023. PMID 16209880. ^ Kandiah, Jayanthi; Yake, Melissa; Jones, James; Meyer, Michaela (2006). "Stress influences appetite and comfort food preferences in college women". Nutrition Research. 26 (3): 118–23. doi:10.1016/j.nutres.2005.11.010. ^ Lebel, J; Lu, J; Dube, L (2008). "Weakened biological signals: Highly-developed eating schemas amongst women are associated with maladaptive patterns of comfort food consumption". Physiology & Behavior. 94 (3): 384–92. doi:10.1016/j.physbeh.2008.02.005. PMID 18325547. ^ Wood, Paulette; Vogen, Barbra D (1998). "Feeding the anorectic client: Comfort foods and happy hour". Geriatric Nursing. 19 (4): 192–4. doi:10.1016/S0197-4572(98)90153-7. PMID 9866509. ^ a b c d e f g h i "Australian Comfort Food Recipes". Food.com. ^ a b c d e f g h i j k l m n o p q r s t "Ultimate Comfort Food". ninemsn Food. ninemsn. Archived from the original on 4 April 2013. ^ Romero, Jo (27 September 2012). "Comfort foods from around the world". Yahoo! Lifestyle UK. Yahoo!. Archived from the original on 26 October 2013. ^ Marks, Kathy (6 December 2003). "Adelaide's 'pie floater' fights losing battle in fast food war". The Independent. ^ a b c d e f g h i j k l "33 comfort foods from around the world". MSN. Microsoft Corporation. Retrieved 12 September 2017. 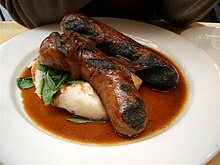 ^ a b "Bangers and mash most popular comfort food as Britons eat more during credit crunch". London: Telegraph. 22 June 2009. Retrieved 8 May 2013. ^ Barnett, Louise (6 October 2009). "Bacon butty is our favourite naughty snack". Sunday Express. Retrieved 13 August 2017. ^ a b c d e f g h i j k l m n o p "British comfort food to make your mouth water". The Daily Telegraph. London. 22 March 2013. ^ a b c d e f g h i j k l m Avis-Riordan, Katie (27 October 2017). "The 20 most comforting foods, according to Brits: Many of the choices remind people of their childhoods". Country Living. Hearst Magazines UK. Retrieved 11 April 2018. ^ a b c d e f g h i j k l m n o p "Best ever British comfort food recipes". Olive Magazine. ^ Carrier, Rhonda (2009). Frommer's London with Kids. John Wiley & Sons. p. 101. ISBN 978-0470593097. ^ a b c d e f g h i j k l m n o "Comfort food recipes". BBC Good Food. BBC. ^ Higgins, Lilly (26 September 2014). "Give Me Five: Who can resist the comfort of egg and chips?". The Irish Times. The Irish Times DAC. Retrieved 11 April 2018. ^ Symon, Michael. "Beer Battered Fish 'n' Chips with Mushy Peas". The Chew. American Broadcasting Company (ABC). Retrieved 12 September 2017. ^ "Stottie cake - the taste of home". Shields Gazette. 2017 Johnston Publishing Ltd. 12 January 2011. ^ (Journalist), Dent, Karen (2016). The North Yorkshire Cook Book : a celebration of the amazing food & drink on our doorstep, featuring over 40 stunning recipes. Green, Tim (Photographer). Sheffield. ISBN 978-1910863121. OCLC 964356602. ^ a b c "Canadian Comfort Food: A collection of uniquely Canadian Cuisine". Historica Canada. The Canadian Encyclopedia. Retrieved 10 May 2016. ^ a b c d e f g h Kelsey, Sarah (20 October 2011). "Canadian Comfort Food: The Bad-For-Us Foods We Can't Resist". HuffPost Canada. The Huffington Post Canada. Retrieved 6 January 2018. ^ a b c d e f g Duncan, Lindsay (14 June 2017). "22 Foods You Can Only Get In Canada". Forkly. Concourse Media. Retrieved 6 January 2018. ^ a b c d e f The Canadian Living Test Kitchen. "15 recipes for the ultimate comfort food". Canadian Living. Retrieved 10 May 2016. ^ "Cashew and tofu merge for creamy vegan cheesecake: Cookbook author and food blogger Sam Turnbull says recipe tastes just like traditional cheesecake". CBC News Ottawa. Canadian Broadcasting Corporation/Radio-Canada. 25 October 2017. Retrieved 6 January 2018. ^ Abraham, Lois (13 March 2016). "'Homegrown' cookbook a labour of love and salute to Canada's producers". Ottawa Citizen. Toronto: Postmedia Network Inc. Retrieved 10 May 2016. ^ a b c d e Wilson-Smith, Meghan. "Top Spots for 14 Wintry Canadian Comfort Food Favourites". WHERE Canada. St. Joseph Media Inc. Retrieved 10 May 2016. ^ a b c d e f g h McLean, Dorothy Cummings (14 January 2016). "Anglo-Canadian Comfort Food". The Historical House. Retrieved 10 May 2016. ^ Rose, Nick (24 April 2017). "How Chop Suey and Ginger Beef Helped Canada Discover Itself". Munchies. VICE Media LLC. Retrieved 6 January 2018. ^ a b c d e f Kelsey, Sarah (20 October 2011). "Canadian Comfort Food: The Bad-For-Us Foods We Can't Resist". HuffPost Living. The Huffington Post Canada. ^ a b Ruiz Leotaud, Valentina (28 April 2016). "Comfort food now caters to Canadian locavores". National Observer. Retrieved 10 May 2016. ^ a b c Davis, Hilary (1 August 2014). French Comfort Food. Gibbs Smith. p. Table of Contents. ISBN 978-1423636984. ^ "What the 'great Nutella riots' of 2018 tell us about the French". The Local fr. The Local Europe AB. 26 January 2018. Retrieved 30 January 2018. France's love affair with the Italian chocolate hazelnut spread Nutella is well-known.... In fact, according to some figures 26 percent of the world consumption of Nutella is done by the French even though the brand is Italian. This means that around a whopping 75,000 tonnes of Nutella are consumed every year in France. France's long love affair with the chocolate spread starts, for many, at childhood when it is the sweet and some say sickly breakfast of choice for many French school children. And according to Paris food writer and author of the blog Chocolate & Zucchini Clotilde Dusoulier it could be this childhood link which is partly behind the France's love for Nutella. "French people eat it by the spoonful. I had it on toast for breakfast as a child," Dusoulier told The Local. "And like with candy, grownups continue to eat it to connect with their inner child." The food writer also explained that the French have a tendency to turn to sweets in times of uncertainty. ^ Walhout, Hannah (22 March 2017). "Pot-au-Feu: The Ultimate French Comfort Food". Food & Wine. Retrieved 30 January 2018. ^ a b c d e Fitria Rahmadianti (26 September 2012). "Comfort Food, Makanan Yang Bikin Nyaman dan Kangen" (in Indonesian). Detik Food. Retrieved 2 September 2014. ^ a b Christina Andhika Setyanti (13 November 2015). "Alasan Sup Ayam Jadi Makanan Paling Dicari Saat Flu". CNN Indonesia (in Indonesian). ^ a b nava-k. "Maggi goreng mamak". Petitchef. Retrieved 31 October 2017. ^ "My Comfort Food – Mie Jamur Pangsit Bakso". Indonesia Eats. 8 August 2007. Retrieved 12 September 2015. ^ Kinanti Pinta Karana (18 November 2010). "Comfort Food Helps Indonesian Maid Recover". Jakarta Globe. Globe Media Group. Archived from the original on 21 November 2010. ^ a b c De Launey, Guy (10 November 2010). "Barack Obama's Indonesia charm offensive". BBC News. Jakarta. Retrieved 12 September 2015. ^ Olivier, Jamie (2014). "Gorgeous gado-gado: An Indonesian mega salad". Jamie's Comfort Food. Michael Joseph. ISBN 978-0718159535. ^ VL. "Nasi Tim Warisan" (in Indonesian). Femina. Retrieved 2 September 2014. 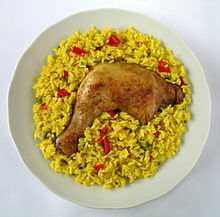 ^ "Indonesian Steamed Rice with Chicken/Nasi Tim Ayam". What to Cook Today?. Retrieved 2 September 2014. ^ "Indonesia - Soto Ayam at Malioboro Country". Chowhound. Retrieved 12 September 2015. ^ Lempert, Phil (2 December 2008). "Italian comfort food: Ricotta gnocchi". TODAY. ^ Carlos, Angela (27 October 2015). "This is the Ultimate Italian Comfort Food Recipe". The Daily Meal. tronc, Inc. Retrieved 2 August 2017. ^ Brassinga, Angela. "7 Favorite Lasagna Recipes: These layered pasta dishes will satisfy your comfort food craving". Sunset. Time Inc. Affluent Travel Group. Retrieved 2 August 2017. ^ Sandoval, Eva (14 August 2012). "The world's greatest comfort foods". CNN. Retrieved 21 July 2015. ^ a b c d e Chavez, Amy (10 March 2015). "10 distinctly Japanese comfort foods". SoraNews24. Socio Corporation. Retrieved 12 December 2017. ^ Joe, Melinda; Marx, W. David; Wee, Darryl; Janette, Misha (12 July 2017). "40 Japanese foods we can't live without". CNN. Cable News Network. Retrieved 12 December 2017. ^ a b c d e f g "Japanese Comfort Food". Japan Deluxe Tours. Japan Deluxe Tours, Inc. 30 August 2017. Retrieved 12 December 2017. ^ Nuzhat (2009). Nuzhat Classic Recipes. AuthorHouse. pp. 1, 2. ISBN 978-1438940328. ^ a b c Valentini, Marinel (17 October 2016). "Best Comfort Food Dishes From The Philippines". The Culture Trip. The Culture Trip Ltd. Retrieved 13 October 2017. ^ a b c d Kryza, Andy (20 January 2014). "Filipino Food for Beginners: The 7 Dishes You Need to Know". ThrillList. Group Nine Media Inc. Retrieved 13 October 2017. ^ Harrison, Melissa (11 May 2014). "24 Delicious Filipino Foods You Need In Your Life". BuzzFeed. Retrieved 13 October 2017. ^ a b c d e f g Galvez, Jane (30 July 2016). "12 Best Filipino Comfort Food For The Rainy Days". Philihappy. Retrieved 13 October 2017. ^ a b c d Ang Pinaka Staff; Ces Vitan (23 August 2012). "Top 10 Best Rainy Day Comfort Foods on 'Ang Pinaka'". GMA News Online. GMA Network. Retrieved 13 October 2017. ^ a b c Pineda, Maida; Lopez-Quimpo, Candice (24 May 2016). "50 dishes that define the Philippines". CNN Travel. CNN. Retrieved 13 October 2017. ^ Tayag, Claude (29 July 2012). "26 top Filipino iconic dishes". The Philippine Star. Retrieved 13 October 2017. ^ "Sinampalukang Manok Recipe". Panlasang Pinoy. Retrieved 13 April 2019. ^ "Sinampalukan: Filipino Chicken Soup". Serve With Rice. Retrieved 13 April 2019. ^ "Creamy Chicken Sopas (Filipino Chicken Macaroni Soup)". Manila Spoon. Retrieved 16 December 2018. 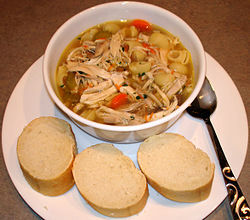 ^ "Chicken Noodle Soup (Sopas) – Filipino version". Foxy Folksy. Retrieved 16 December 2018. ^ Ardis, Susan (7 November 2012). 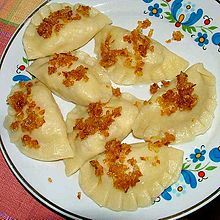 "Pierogies: Comfort food, Polish style". The State. ^ Scatts (17 January 2011). "What Is Polish "Comfort Food"?". Polandian. Wordpress. ^ Izlar, Camille (14 February 2013). "Polish Comfort Food: Best Way to Stay Warm". Steve Dolinsky. ^ a b c d Russell, Michael (12 March 2015). "Boriken brings Puerto Rican comfort food to Beaverton (and beyond)". The Oregonian. Retrieved 8 April 2015. ^ a b c d e Edwards, Melanie (29 May 2012). "5 Traditional Puerto Rican Foods I Wish My Daughter Ate". Fox News Latino. Retrieved 8 April 2015. ^ a b c d e f g Olmsted, Larry (18 October 2012). "Great American Bites: Classic Puerto Rican comfort food at El Jibarito". USA Today. Retrieved 8 April 2015. ^ a b c Speakerman, Meghan Ruth (17 September 2012). "Puerto Rican Inspiration". Austin Chronicle. Retrieved 8 April 2015. ^ a b c Acker, Kerry (24 January 2013). "Spanish Comfort Food Favorites". Epicurious. Condé Nast. Retrieved 3 April 2019. 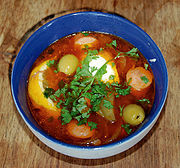 ^ "Traditional Spanish Comfort Food at Home: Cocido Madrileño Recipe". Devour Madrid. Devour Tours. 8 November 2018. Retrieved 3 April 2019. ^ "Behind the Bite: Tortilla de Patatas". Devour Madrid. Devour Tours. 19 November 2018. Retrieved 3 April 2019. ^ "10 Classic Taiwanese Dishes". LA Weekly. 2012. Retrieved 21 July 2014. ^ a b "45 Taiwanese foods we can't live without". CNN. 2014. Retrieved 21 July 2014. ^ a b "Tasty snacks go well with TaiwanFest fun". The Georgia Straight. 2008. Retrieved 21 July 2014. ^ a b "Taiwan's Top Winter Comfort Foods". The Wall Street Journal. 2013. Retrieved 21 July 2014. ^ "The ultimate comfort food: manti, or turkish dumplings". LA Weekly. 2011. Retrieved 9 February 2014. ^ "Manti: A Food Without Borders". The Atlantic. 2009. Retrieved 9 February 2014. ^ a b c Joseph, Dana (10 May 2012). "American food: the 50 greatest dishes". CNN Travel. ^ Bretherton, C. (2013). Pies: Sweet and Savory. DK Publishing. p. 218. ISBN 978-1-4654-1243-0. Retrieved 1 October 2015. ^ a b c d e f g h i j k l m Stoley, Emma (20 January 2012). "America's Best Comfort Foods". Travel+Leisure (Time Inc.). Retrieved 21 July 2015. ^ a b c d e f g h i Brown, Alton. "America's Best: Top 10 Comfort Foods". Food Network. Retrieved 21 July 2015. ^ a b c d e f g h i j k l m n o p q r s "101 Best Comfort Food Classics". Southern Living. Time Inc. Lifestyle Group. Retrieved 5 April 2016. ^ Slotnik, Daniel E. (26 May 2012). "What's Your Comfort Food?". The New York Times. ^ Fiduccia, K.; Rowinski, K. (2013). The Ultimate Guide to Making Chili: Easy and Delicious Recipes to Spice Up Your Diet. Skyhorse Pub. p. 118. ISBN 978-1-62087-189-8. ^ Karina Martinez-Carter (14 February 2014). "As American as peanut butter". Pacific Standard. Retrieved 6 December 2017. ^ "Comfort and Company". Food Network. Retrieved 21 July 2015. ^ "Chefs' Comfort Food Cook-Off". Southern Living. Time Inc. Lifestyle Group. Retrieved 5 August 2015. ^ Gardens, B.H. (2011). The Ultimate Casseroles Book: More than 400 Heartwarming Dishes from Dips to Desserts. Better Homes and Gardens Ultimate. Houghton Mifflin Harcourt. p. 83. ISBN 978-0-544-18850-1. Retrieved 3 July 2016. Hoffman, Jan. "The Myth of Comfort Food". Well. Retrieved 21 April 2016. "USATODAY.com - Women like sugar, men like meat". usatoday30.usatoday.com. Retrieved 21 April 2016.